Do I have any cavities? This continues to be the number one question kids and adults ask at their routine dental appointment. Dental cavities, also called caries or decay, are a common dental health concern. It may also be one that you don’t know much about. Here are some cavity basics to ensure you have a proper understanding of what a cavity is and how to avoid them. A cavity begins as a tiny lesion or hole in your tooth. This opening occurs in the hard outer surface of the tooth. It is considered damage to the enamel of the tooth, and the inner structures of the tooth are consequently left more vulnerable. Not all cavities are treated right away. If you are diligent about your routine dental visits, we may see a cavity at its earliest stage. In such cases, we may decide to “watch and wait”. Decay is a slow progressing disease. A tooth may begin to decay because acid in your mouth leaches out the minerals of the enamel and causes it to break down. Fluoride therapy, dietary changes and better oral hygiene can potentially reverse this process if it is caused early. Essentially, the tooth may be able to remineralize. Cavities may not produce any symptoms or only subtle signs. In most cases, your dentist can detect a cavity before you ever feel symptoms. You won’t actually be able to see the hole in your tooth. Instead, you may experience sensitivity, pain when biting, or a mild toothache. Adults can get cavities too. Cavities aren’t just for kids, although children are most prone. People of all ages are susceptible to tooth decay. Avoiding cavities is simple. By brushing twice a day with a fluoride toothpaste, flossing daily, eating right and maintaining routine dental visits, your risk for cavities diminishes greatly! 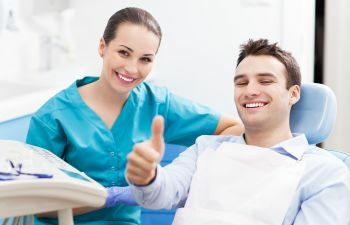 Need to schedule that routine dental cleaning? Call Mitzi Morris, DMD. Remember that professional dental cleanings are the only way to remove hardened plaque, which contributes to decay!